Time is Flying… | the best is yet to come. It has been almost two weeks since my last blog post! I apologize that I didn’t keep my word and post at least once a week but it has been hectic here. Let me back track a few weeks so I can fill you all in on what has been consuming my time here. Saturday night was a sponsored event by Dream Careers. It was a lovely evening that really gave me a taste of the Hong Kong culture! All the interns as well as the program leaders met in the lobby of our dorms at 5:45pm. We were provided a charter bus to chauffer us to each destination and a tour guide named Tim. I know it is his job to know the ins and outs of Hong Kong but I was really impressed with his knowledge. Some of the facts I learned are: 1) the population of Hong Kong is 7.072 million (Manhattan is 1.602 million), 2) there are eight main tunnels in Hong Kong, 3) less than 25% of the land is developed, 4) Chinese and English are the official languages of Hong Kong. The first stop on our bus tour was Temple Street Market. The market is a popular street bazaar, named after a Tin Hau temple located in the center, and a place so steeped in local atmosphere that it has served as the backdrop to many a memorable movies. Temple Street Market is sometimes known as Men’s Street as it is very popular for men’s fashion. The market starts at 2 p.m. in the afternoon, but is most lively at dusk. Traffic is closed on the street at that time, and visitors swarm into the street. There are more than a hundred stalls with colorful lights in the market. There are carts bulging with goods from clothing to cell phones and watches. Beyond shopping, the market provides entertainment in the form of fortunetellers and traditional Cantonese opera singers. After bartering a bit I purchased a knock-off Marc by Marc Jacobs purse, a USB flash drive shaped like a small Nikon Camera, and a little jeweled elephant that can hold trinkets. From the market we headed out to dinner. The bus drove to the Jumbo Floating Restaurant located within Hong Kong’s Aberdeen Harbor. Over 30 million visitors have visited this famous restaurant including Queen Elizabeth II, John Wayne, Tom Cruise, and Gong Li. Dr. Stanley Ho established the floating restaurant in 1976. It took four years and millions of dollars to design and build. It is ornamented in the style of a gorgeous and exquisite ancient Chinese imperial palace. Over the past decades, Jumbo has been much appreciated by locals and tourists alike, and has become a scenic landmark of Hong Kong. When we arrived at the restaurant we got to look at the seafood exhibition and see where exactly our food was coming from. One of the fish was approximately 25 pounds and would cost 6,000 HKD ($833 USD) if you wanted them to cook it up for you. It was called a Garoupa fish. The dinner was served in eight courses and every course was delicious. Some highlights included: corn soup, sweet and sour grouper, and mango pudding. After eating, we took group photos at the reconstructed emperor’s palace at the other end of the restaurant. Once we finished our food we all slowly “wobbled” out of the restaurant and back onto the bus. The final destination was Victoria’s Peak! Standing at 552 meters (1,811 feet) above sea level, the Peak is the highest mountain on Hong Kong Island. As I overlooked Hong Kong from Victoria’s Peak I immediately thought of how much I wished my parents were there with me to take it all in. I took plenty of photographs of the view but nothing will compare to the real thing. Even though my parents weren’t there I did have my amazing new friends by my side. We all took photos together which wasn’t easy since the sun had set. 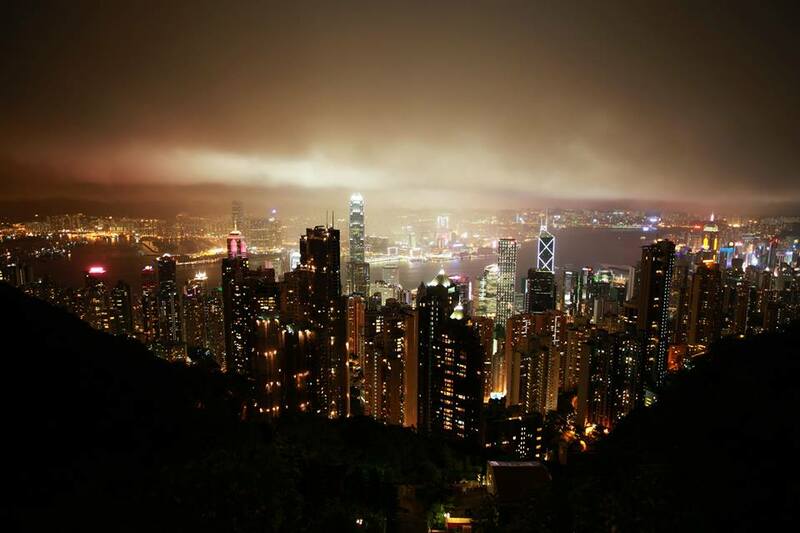 Looking out over the nightlife of Hong Kong was breath taking, there was nothing like it. To see Hong Kong above the skyscrapers as opposed to walking beneath them like I had been all week was so refreshing. It helped me see just how expansive and orderly Hong Kong really is. It seems to me when Hong Kong was built, the architects focused on enhancing the beauty of the natural landscape. I think they did a magnificent job! If there is one place you visit while in Hong Kong then go to Victoria’s Peak. It is the best place to marvel at the beautiful city and harbor.